The pre-film content before The Good Dinosaur (2015) includes, not only the expected Pixar short, but a greeting by the film’s director, Peter Sohn. While a common occurrence now—filmmakers greet audiences in theaters to thank them for coming to see the movies on a big screen (and presumably for paying to do so)—Sohn’s comments are particularly resonant with the two big themes of Pixar’s cinema. These films stress the importance of artistic creativity and highlight the advantages of bringing together different cultural experiences of the world. Sohn describes his love of animation as a universal language beyond the constrictions of verbal language. He explains the importance of Walt Disney films for him as a child, as he was able to experience the movies with his mother, who did not speak English. Sohn would normally translate for her while they watched together. However, the scene in Dumbo (Walt Disney, 1941) when the baby elephant and his mother are kept separate falls into a special category, the raw, culturally universal emotional power of the scene requiring no translation whatsoever. The short film, particularly in the hands of contemporary Pixar animators, has paid off time and again on promise of this scene. The wordless animated Pixar cartoon continues to deliver profoundly moving experiences, particularly about cultural difference. Sohn’s previous short, Partly Cloudy (2009) is a perfect example of the wordless power of the Pixar short to meaningfully convey the benefits that accrue from true cultural diversity. The short begins where Dumbo left off: in the earlier film, the storks delivered various animals babies to their mothers in the circus, the mamma elephant receiving a big-eared aberration who turns out to become the star of the show when it is revealed that he can use the appendages as wings. In Partly Cloudy, we follow not the babies, but the storks that deliver them. The birds fly high into the sky, where cloud creatures create the young and hand their creations off for airmail delivery. Storks visit white puffy cloud creatures that repeatedly construct cute kittens and puppies. One cloud even makes human babies, complete with footballs and helmets. A tilt downward reveals one outlier cloud, a dark and gloomy creature set apart from all the others. This creative fellow churns out not the cuddly and furry, but the toothsome and scaly. The first output we see is a feisty crocodile that proceeds to bite his cloud finger off. The dark cloud’s loyal stork arrives, saluting and reporting for duty. The cloud gives a huge bear hug to his avian colleague, who responds in kind by kissing him repeatedly on the cheek. The lizard proceeds to swallow the bird whole, but once wrapped up safely, the stork can fly away to make his delivery to the swamp. With each return, our exuberant cloud has devised yet a more dangerous creature: a ram with giant horns, then a porcupine with razor-sharp spines. When the cloud begins preparing a giant shark baby, the stork flies up to one of the white puffy clouds. As the stork laughs and whispers to the other cloud, our creative genius thinks he’s been abandoned and betrayed: he begins thundering in anger and then raining with tears. However, soon thereafter, a feather lands on the cloud’s nose to portend reconciliation, again echoing Dumbo; the stork returns with a bundle, filled not with a baby, but with the football helmet and some padding. Crucially, the film’s solution is not to flatten cultural difference, but instead use creativity to solve the minor problems that difference entails for us. If the cloud is going to populate the world with feisty creatures, the stork will need to figure out how to protect himself during their delivery. For his last creation, the cloud whips up an eel, which proceeds to blast the stork with waves of electric shock. As the camera cranes away, the cloud and the stork contentedly hug the baby eel. All is well: the world we leave is filled with an endless plethora of creatures, tended to by inventive, caring creators. Such values are stunningly on display in the short that accompanies The Good Dinosaur, Sanjay’s Super Team. This time, cultural difference is not allegorized via animal metaphors, as in Dumbo, but directly represented as family melodrama. Director Sanjay Patel builds a one-room world in which the values of the young and the old, the Western and the Eastern collide in an epic battle. Frame left sits Sanjay, who loves watching television, in particular an animated superhero show whose star Sanjay has in his hand in action figure form, a character who looks suspiciously like one of the Incredibles from the 2004 Pixar feature. Frame right sits Sanjay’s father, who sits in front of a shrine to his Hindu gods, the shrine looking suspiciously like a 1950s wooden television cabinet. As the film begins, we arrive in a world where Sanjay’s values are in conflict with those of his father. When his father begins ringing a bell to honor his gods, Sanjay gets annoyed that he cannot hear his television show. He proceeds to turn up the volume. This in turn aggravates his father, whose prayers have been interrupted by the loud noise of the television. Sanjay controls the volume buttons on the television, but his father holds the trump card, the remote control device. When father finally has had enough, he clicks off the television from the other side of the room, demanding that Sanjay come to the his, the right side, of the room and sit on the prayer mat. While sitting in front of the shrine, a bored Sanjay accidentally blows out the candle. He is immediately sucked into the world of the gods inside the shrine, where an evil spirit threatens the world. Three Hindu gods spring into action to battle the demon, thus replicating the world of Sanjay’s television show. With the little boy’s help, the gods prevail and return the demon to the netherworld, using the ringing of the bell. 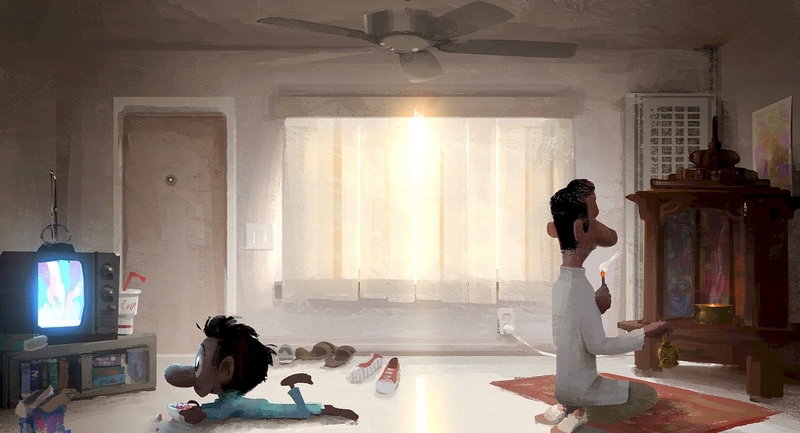 When Sanjay returns to his living room, he has been empowered with the insight that the mythology of his family’s religion is akin to that of his animated heroes. Simultaneously, Sanjay’s father comes to realize that his son is more interested in his religion than he previously gave him credit. Father and son meet in the middle of the room, a space where the superheroes of Western youth culture can co-exist with the gods of Hindu religion. Sanjay’s Super Team is an exquisite combination of the two master themes of the Pixar tradition. It is a film that revels in creativity: Sanjay draws his heroes on paper, animating them with his artistic vision, spurred to new cultural creation by the television. Sanjay’s father contemplates the universe in front of his shrine, oblivious to the commercial television that feeds its spectators that which to think. More than either perspective, the Pixar cartoon finds the middle of the room a far more aesthetically pleasing and intellectually stimulating place to be. The edges of the room, worlds of either Western television or Eastern religion, is far inferior to the center, where father and son can be together, fructified by both mythological traditions. This middle ground is the world of the Pixar film, where creativity and diversity intermingle; it is a place I long to find in our real world.